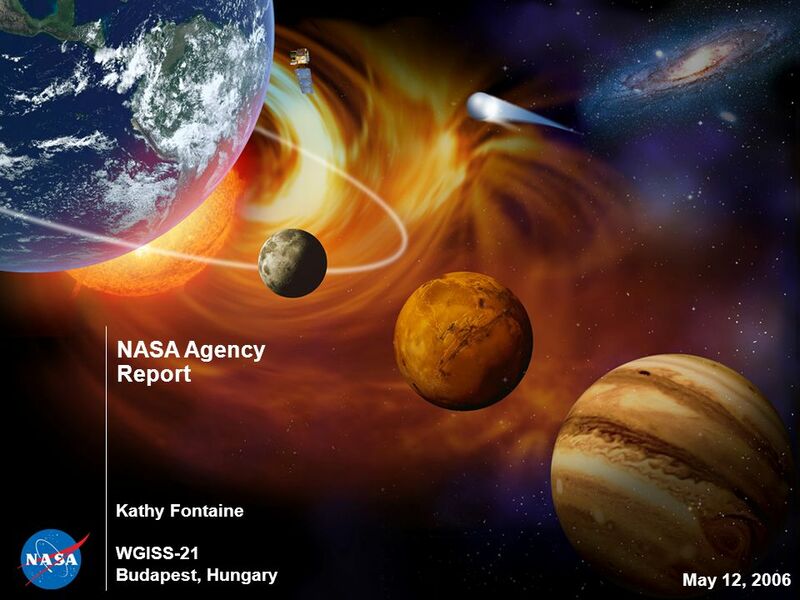 NASA Agency Report May 12, 2006 Kathy Fontaine WGISS-21 Budapest, Hungary. 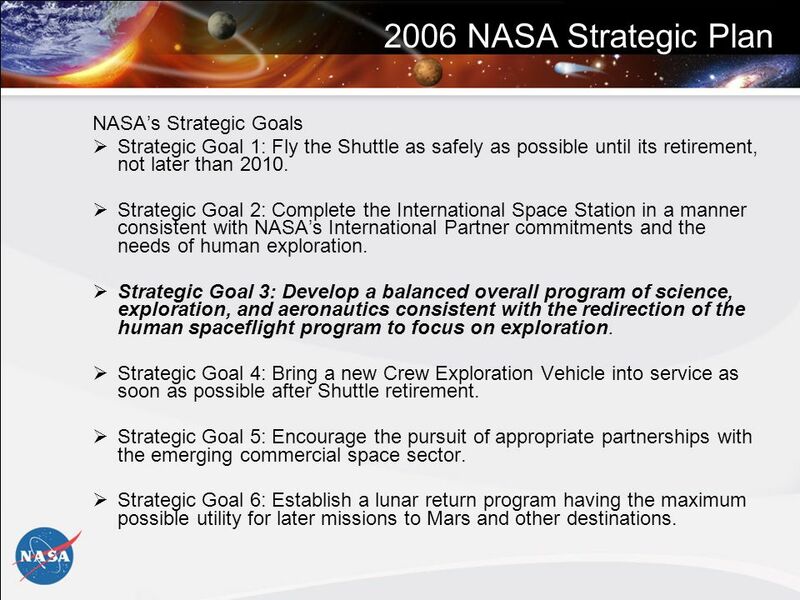 3 2006 NASA Strategic Plan NASAs Strategic Goals Strategic Goal 1: Fly the Shuttle as safely as possible until its retirement, not later than 2010. Strategic Goal 2: Complete the International Space Station in a manner consistent with NASAs International Partner commitments and the needs of human exploration. 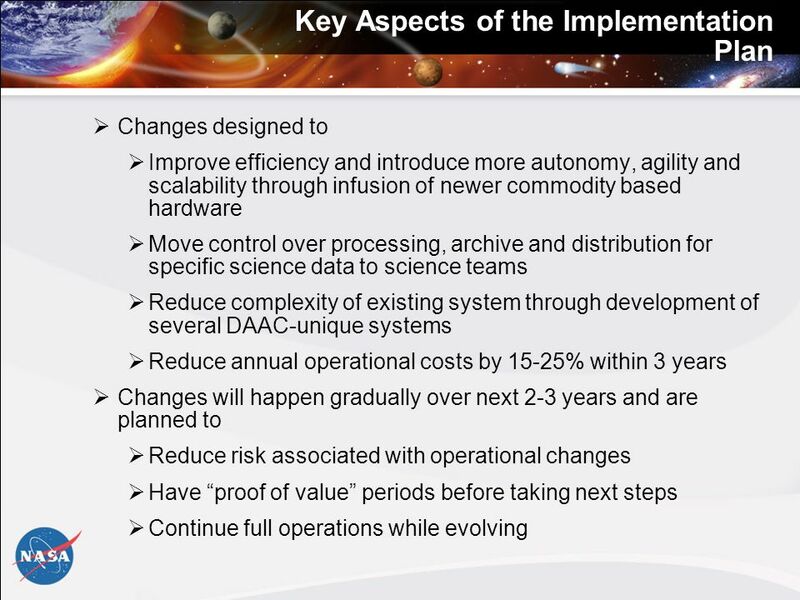 Strategic Goal 3: Develop a balanced overall program of science, exploration, and aeronautics consistent with the redirection of the human spaceflight program to focus on exploration. 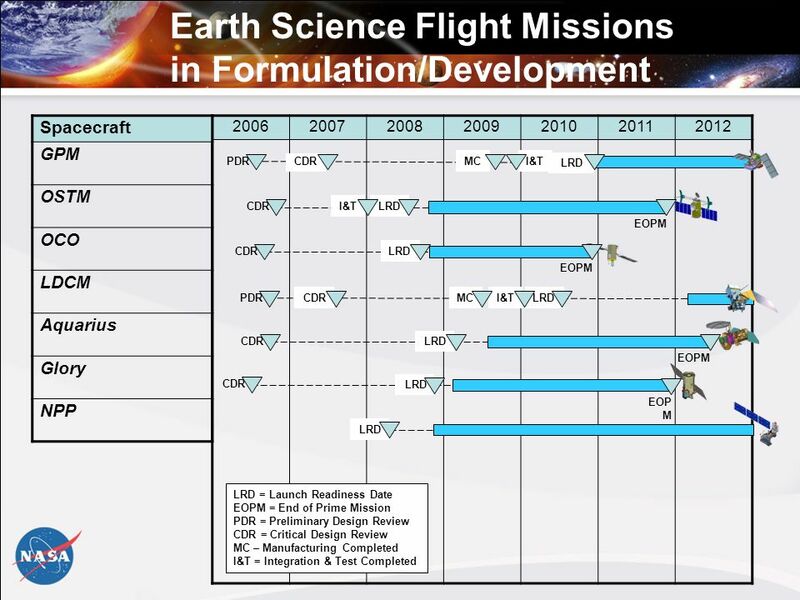 Strategic Goal 4: Bring a new Crew Exploration Vehicle into service as soon as possible after Shuttle retirement. Strategic Goal 5: Encourage the pursuit of appropriate partnerships with the emerging commercial space sector. Strategic Goal 6: Establish a lunar return program having the maximum possible utility for later missions to Mars and other destinations. 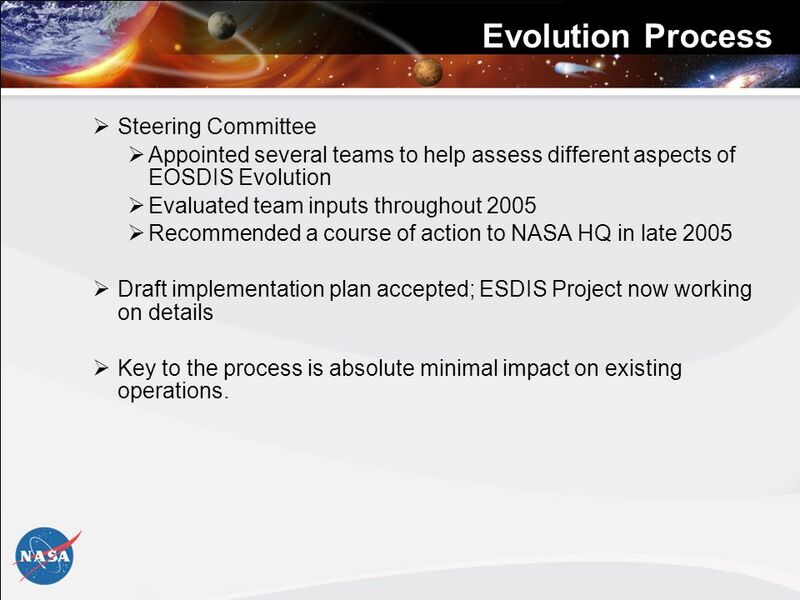 11 Evolution Process Steering Committee Appointed several teams to help assess different aspects of EOSDIS Evolution Evaluated team inputs throughout 2005 Recommended a course of action to NASA HQ in late 2005 Draft implementation plan accepted; ESDIS Project now working on details Key to the process is absolute minimal impact on existing operations. 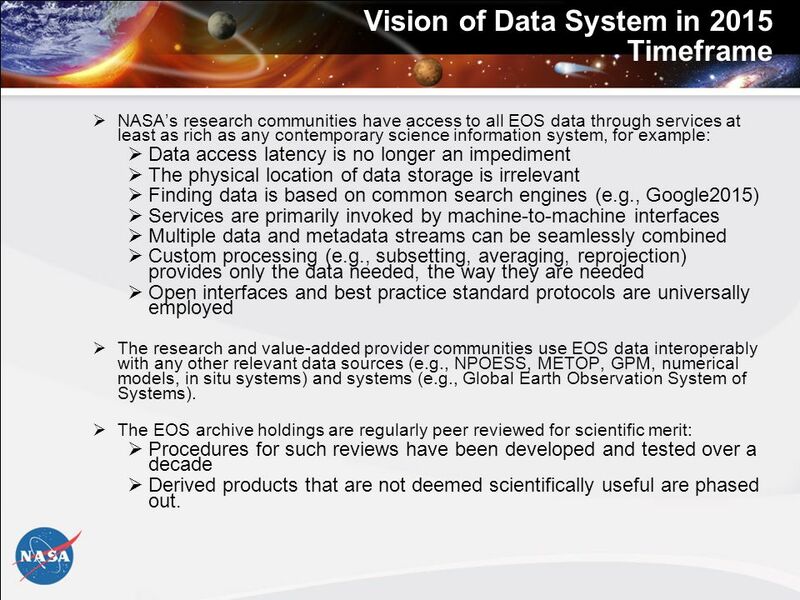 12 Vision of Data System in 2015 Timeframe NASAs research communities have access to all EOS data through services at least as rich as any contemporary science information system, for example: Data access latency is no longer an impediment The physical location of data storage is irrelevant Finding data is based on common search engines (e.g., Google2015) Services are primarily invoked by machine-to-machine interfaces Multiple data and metadata streams can be seamlessly combined Custom processing (e.g., subsetting, averaging, reprojection) provides only the data needed, the way they are needed Open interfaces and best practice standard protocols are universally employed The research and value-added provider communities use EOS data interoperably with any other relevant data sources (e.g., NPOESS, METOP, GPM, numerical models, in situ systems) and systems (e.g., Global Earth Observation System of Systems). 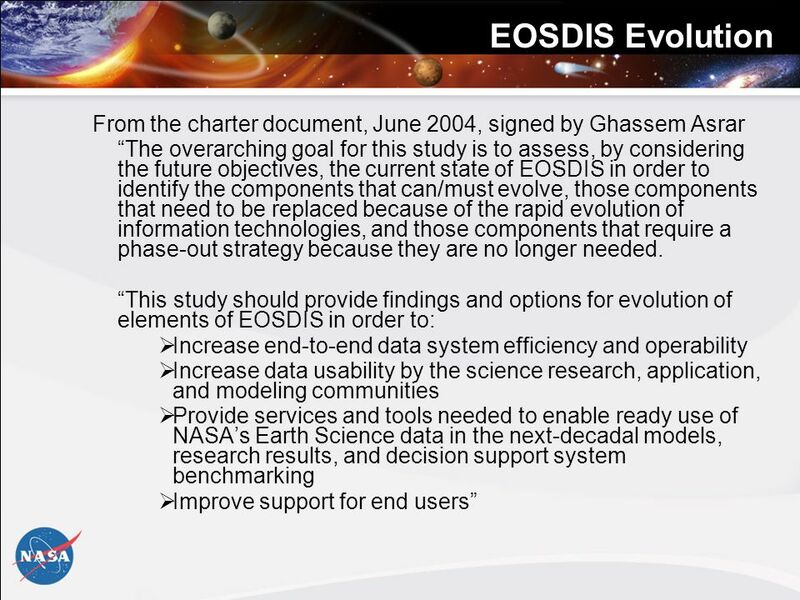 The EOS archive holdings are regularly peer reviewed for scientific merit: Procedures for such reviews have been developed and tested over a decade Derived products that are not deemed scientifically useful are phased out. 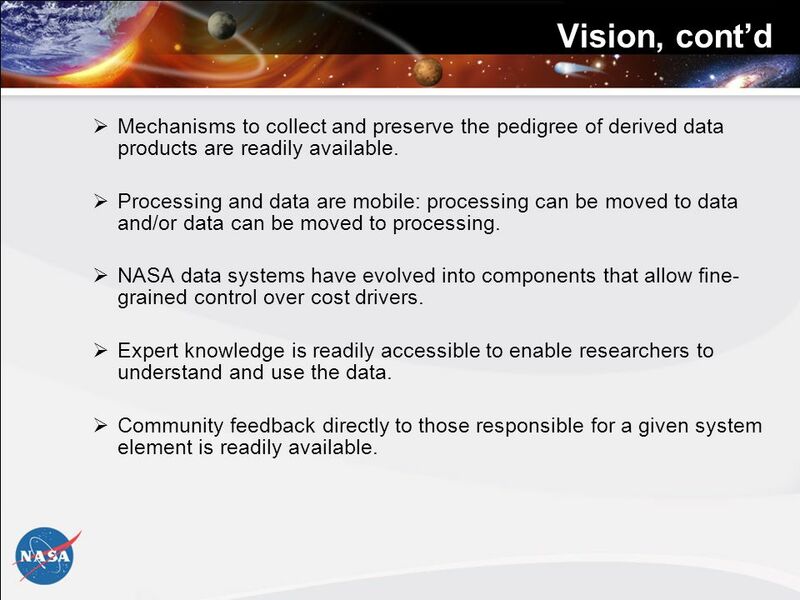 13 Vision, contd Mechanisms to collect and preserve the pedigree of derived data products are readily available. Processing and data are mobile: processing can be moved to data and/or data can be moved to processing. 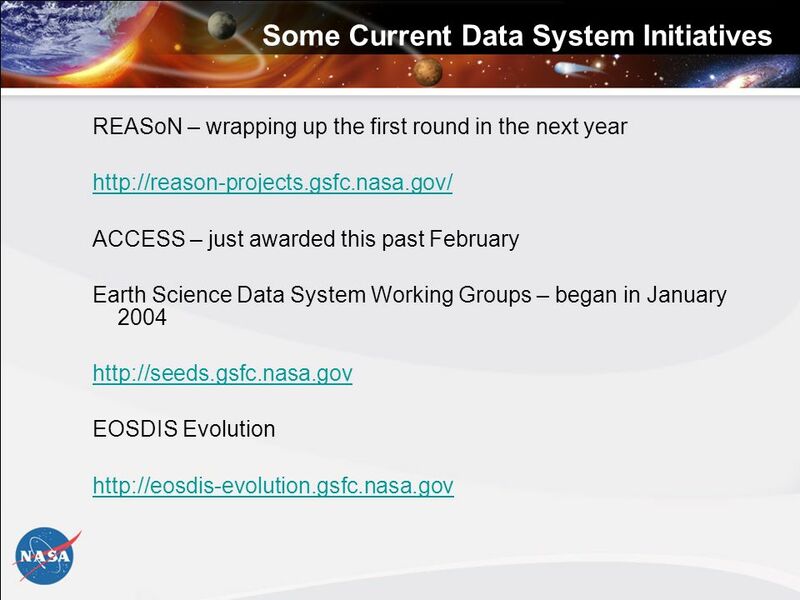 NASA data systems have evolved into components that allow fine- grained control over cost drivers. Expert knowledge is readily accessible to enable researchers to understand and use the data. Community feedback directly to those responsible for a given system element is readily available. 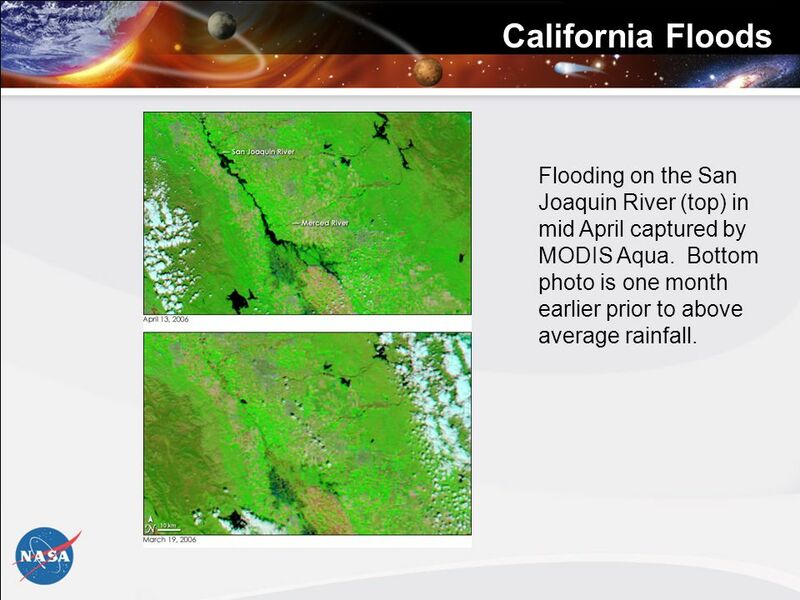 16 California Floods Flooding on the San Joaquin River (top) in mid April captured by MODIS Aqua. Bottom photo is one month earlier prior to above average rainfall. 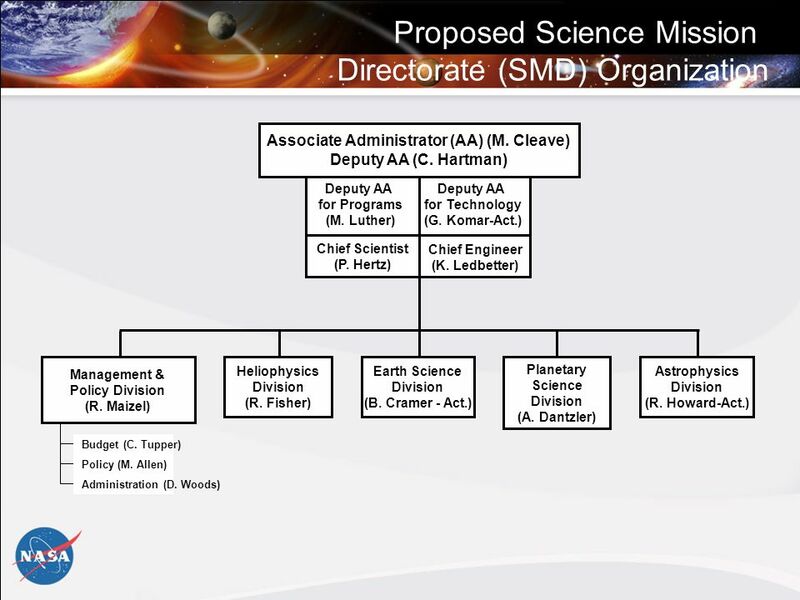 17 Summary Science organization and planning at NASA has undergone considerable change over the past year, and there is more to come. 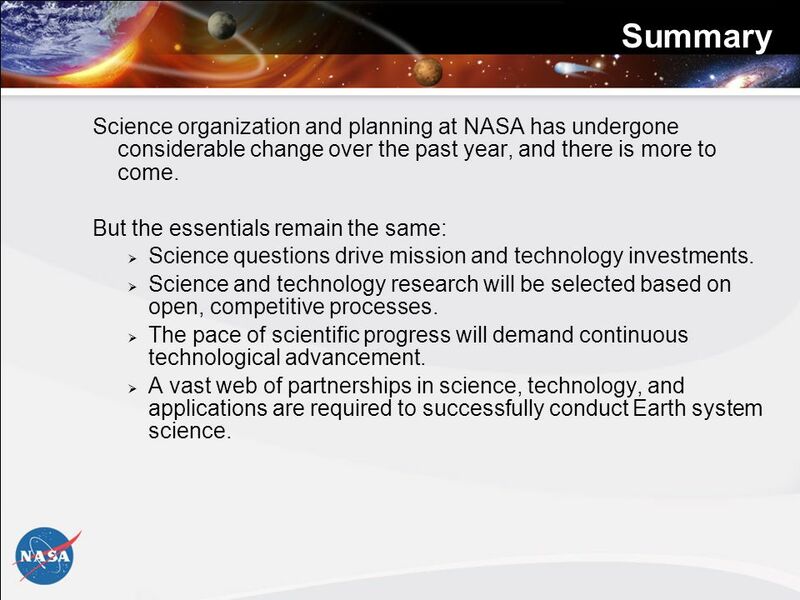 But the essentials remain the same: Science questions drive mission and technology investments. Science and technology research will be selected based on open, competitive processes. The pace of scientific progress will demand continuous technological advancement. 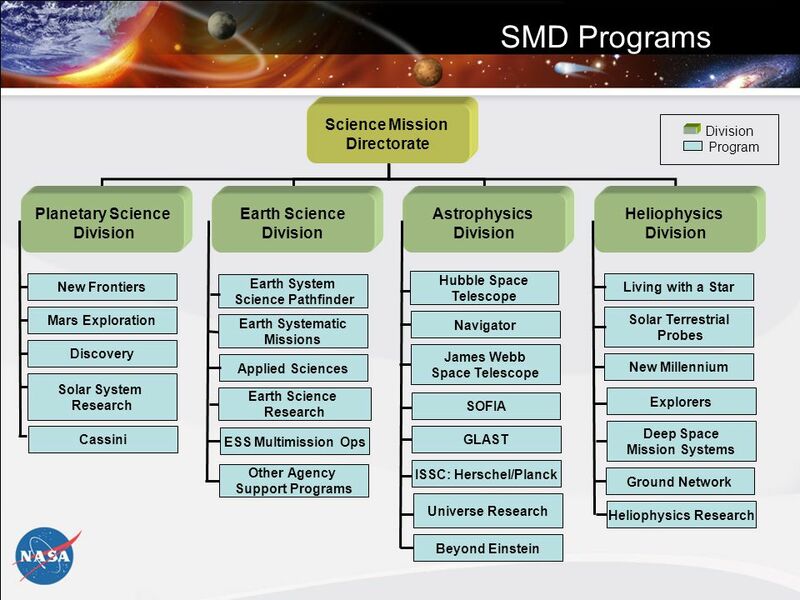 A vast web of partnerships in science, technology, and applications are required to successfully conduct Earth system science. 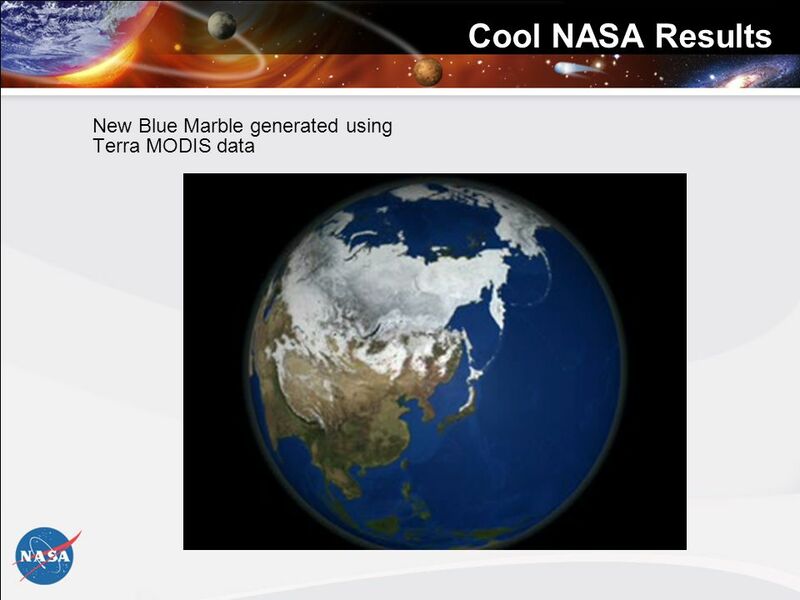 Download ppt "NASA Agency Report May 12, 2006 Kathy Fontaine WGISS-21 Budapest, Hungary." NASA Agency Report Kathy Fontaine WGISS-23 Hanoi, Vietnam May 25, 2007. 1 Small Business Innovation Research Small Business Technology TRansfer Kathryn Packard, JSC SBIR/STTR Technology Infusion Manager Texas SBIR/STTR Summit. CYPRUS UNIVERSITY OF TECHNOLOGY Internal Evaluation Procedures at CUT Quality Assurance Seminar Organised by the Ministry of Education and Culture and. 1 Performance Assessment An NSF Perspective MJ Suiter Budget, Finance and Awards NSF. NASA Commercial Crew Program COMSTAC May 2011 Page 1 National Aeronautics and Space Administration COMMERCIAL CREW PROGRAM COMSTAC May 2011 E. Mango Commercial. 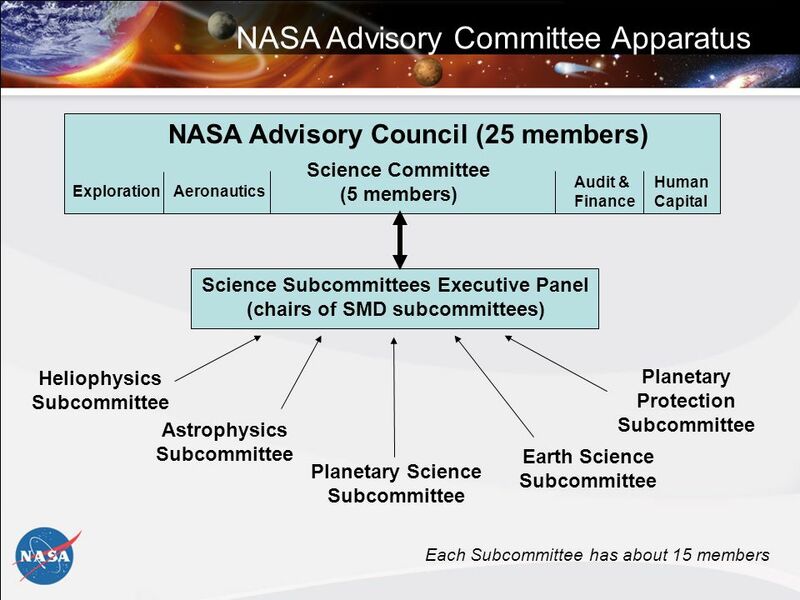 NASA Mission Directorates. 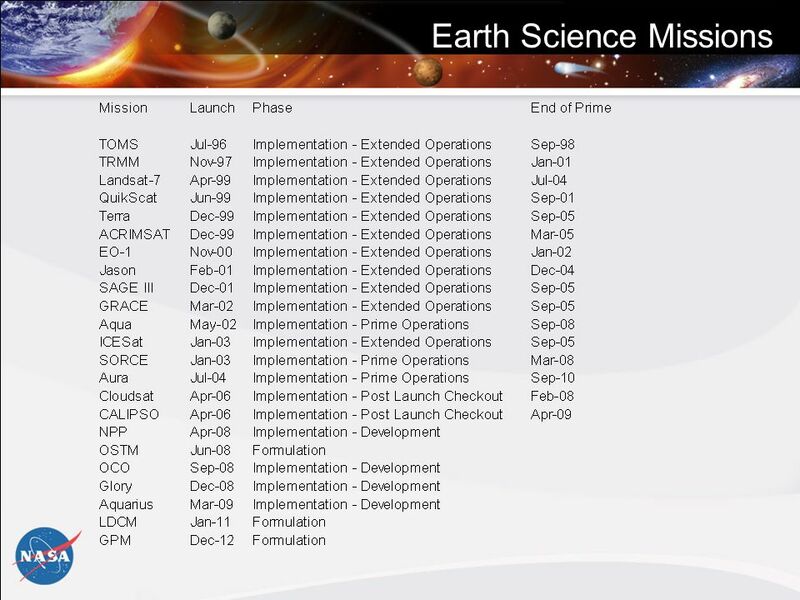 0 NASA's mission is to pioneer future space exploration, scientific discovery, and aeronautics research. NASA’s Mission. NASA AGENCY REPORT Dr. Eric J. Lindstrom Physical Oceanography Program Scientist Earth Science Division Science Mission Directorate MARCH 12, 2007. 1 Briefing to the CAA on the Terrestrial Planet Finder (TPF): Finding and Characterizing Earth-like Planets Zlatan Tsvetanov, NASA Program Scientist Charles. 1 FAA Reform: Congressional Staff Briefing January 24, 1996. National Aeronautics and Space Administration Commercial Crew Initiative Overview and Status to the COMSTAC Philip McAlister NASA Exploration Systems Mission. NASA Living with a Star Program Targeted Research & Technology Steering Committee NASA HQ & LWS TR&T Update September 16, 2008 Doug Rowland On Detail to. National Aeronautics and Space Administration The Future of Space Exploration Orion, Ares and Beyond.... AIAA / NSC / JPL Town Hall Meeting 26 April 2007. NASA_G_O_02_09_05.ppt 1 National Goals and Objectives National Goal To advance U.S. scientific, security, and economic interests through a robust space. 1 NASA Agency Overview NASA’s Vision and Fundamental Physics in Space Paul Hertz Chief Scientist, Science Mission Directorate NASA International Workshop. 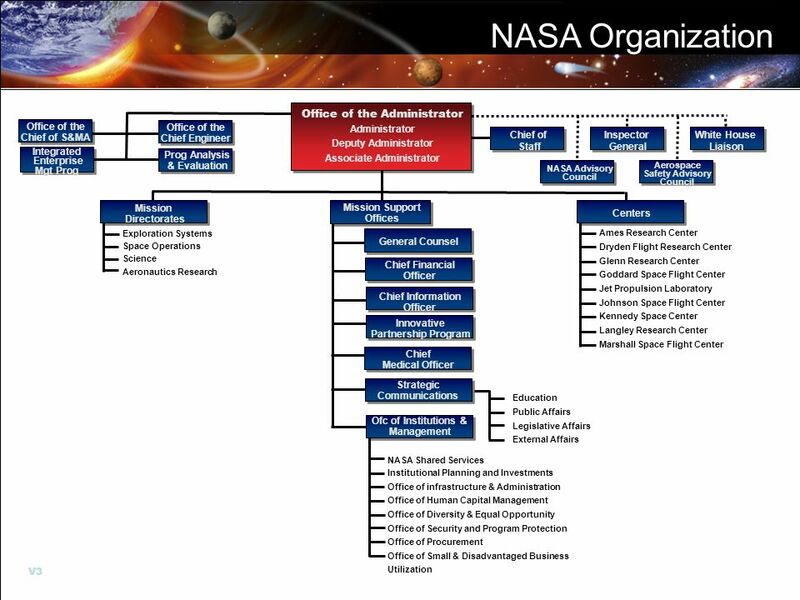 Know how NASA plans and implements space missions Comprehend the essential components of a space mission Comprehend the selection and training of astronauts.